The 2045 initiative has received the blessing and support from the Dalai Lama, as it prepares to announce the second Global Future 2045 Congress, being held in New York, June, 2013. Dmitry Itskov, founder of 2045, met His Holiness Tenzin Gyatso, the 14th Dalai Lama, in his residence in Dharamsala, a small mountain town in northern India. They discussed the three major steps of 2045 Avatar Project. First, the creation of a human-like robot dubbed “Avatar A,” and a state-of-the-art brain-computer interface system to link the mind with it. Next, it be created a life support system for the human brain, which connects to the “Avatar A,” turning into “Avatar B.” The third step, named “Avatar C”, is developing an artificial brain in which to transfer one’s individual consciousness with the goal of achieving cybernetic immortality. Creating the “Avatar C” through developing an artificial brain and understanding the nature of human consciousness, says the Dalai Lama, could be attainable, and would be a great benefit to future development of science. 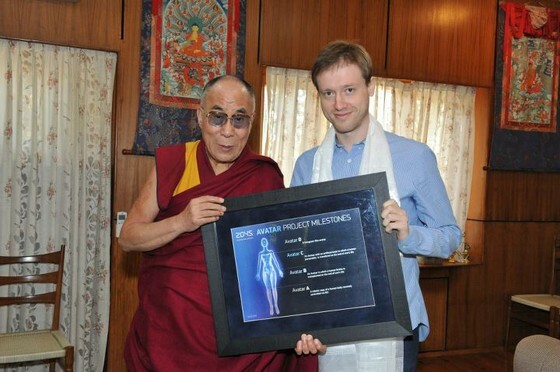 Dmitry Itskov, founder of 2045 Initiative, with His Holiness, the Dalai Lama, at his Dharamsala residence. Several months ago, DARPA – the Pentagon’s research arm – announced their own plans on creating a militarized avatar project, serving as a soldiers surrogate on the battlefield. “My project has very different, humanitarian goals – it involves technologies that could mark a transition for humanity, with endless benefits in the future. But already in the next few years, we will be able to enhance the life of those who are disabled, radically improving their living standards. This is just the beginning. It’s my goal to ensure it is affordable and accessible for all people - not just for the elite and the military,” said Itskov. Itskov has been reaching out to spiritual leaders to start a dialogue about how they could reach harmonious integration with scientists. “It’s important to establish a bridge between scientists and spiritual leaders for a successful transition to a new phase for humanity,” he said. The 2045 initiative held its first Global Future 2045 Congress in Moscow, in February 2012. There, over 50 world-leading physicists, biologists, anthropologists, sociologists, psychologists, and philosophers met seeking to develop a strategy for further development of the humankind. The initiative’s goal is to create a network with the world’s leading scientists who are focused on the development of cybernetic technology with the ultimate goal of transferring human’s individual consciousness to an artificial carrier. The network will act as an investment hub, contributing to various projects around the world. The next Global Future 2045 Congress will be held in June 2013, in New York City. For more information, please visit www.GF2045.com.